a pulp friction massage or a soothing soak in vintage tinted baths. Kenwood Inn, the first vinotherapy spa in the US, is snuggled into the heart of California's wine country where, amongst a full array of treatments to choose from, you can get your skin slathered with grape seed oil, honey and salt followed by a quick mist of grape water. In Italy, the vinothérapie spa Relais San Maurizio is housed in a 17th century monastery overlooking the vineyards of Piedmont. Wine massages, scrubs, facials and wraps are provided along with a cocktail bar honoring Ernest Hemingway. Not to be overlooked, South African vineyards have also entered the spa scene. A short distance from Cape Town is the Santé Winelands Hotel and Wellness Center. Its vinotherapy treatments include chardonnay wraps, grape detox diets and wine casket baths. Whichever one you choose, you'll come out a little happier and a lot healthier. i bet you would be happier to take a wine bath..its entoxicating!! Bordeaux is famous because of the wines. Now I learned that it seems it is a nice place to travel, too. a very informative article. I have never known these other benefits and uses we can have out of grapes and everything in it. very good! These places mentioned here are simply so dramatic and lovely. I can almost sense the peace and tranquility. With the spa from the vine, and all the services, I think it should be a life experience worth a try. Vinotherapy is a good medical use of wine in France, in India too there is a similar use of wine. It is prohibited to drink but used as a medicine. Wow! good article. I heard a lot about wine spas but I never knew the first official wine spa started in Bordeaux, France. The Vinotherapy Spas will be liked by anyone as it includes wine casket baths, chardonnay wraps etc. Wine is healthy. So, person that can afford this can simply taste the true beauty of wine. Vinotherapy as a concept seems interesting and will attract not only the wine lovers but a large segment of people looking for remedies. Yes, Bordeaux is a very beautiful city in france.But i´ve never tested that kind of SPA could you give a link? I would love to try a wine spa like this once. I'm sure it would feel really luxurious! 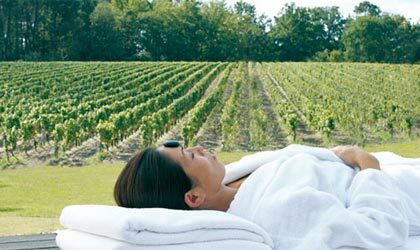 Its rather a tempting feeling of a wine therapy and a spa is really a refreshing idea.Thanks for providing the detailed vinotherapy treatment with details of Les Sources de Caudalie.Can you provide me the details of such spa treatments available in Asia which would be very helpful for me. I'm not usually a person who would WANT a spa treatment, but this sounds divine. I wonder if you get to sip wine while you are being pampered by the by-products? Too bad I'm too far away from wine country. From the name itself, Vinotherapy, its already relaxing. What I like about it is that they use natural products and so you'd be sure that there will be no harsh chemicals or toxins that would touch your skin. Its definitely a must try!